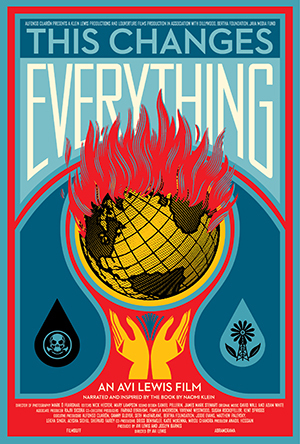 The Sustainability Division and the Students of Sustainability will sponsor a free screening of the environmental documentary “This Changes Everything” on Wednesday, Feb. 3, at 7 p.m. in Watson Theater. The climate film is narrated and inspired by the international best-selling book of the same name by Naomi Klein, award-winning journalist. Klein and filmmaker Avi Lewis created the documentary to shed light on how our economic system is linked to increased carbon in our atmosphere. Klein argues that if we seize the chance, this environmental crisis can help to build a better economic system. Lewis had questions about climate change and how to create a film that was easy to understand without being discouraging. “I found the answers in people, in the hundreds who shared their stories and lives with us during the course of shooting this film, over four years, in nine countries and five continents,” he said. These stories relate to mining, drilling, coal-fired power plants and broken oil pipelines. The film depicts seven communities, on locations ranging from the Alberta Tar Sands to Montana’s Powder River Basin, Northern Greece, Beijing and South India. Its intention is to empower rather than scare. The screening is a follow-up to Klein’s fall 2015 visit to SU for University Lectures, where she discussed the book and the implications of climate change on our global economy and political systems. Klein believes we can work together to change our economic system to combat the climate change crisis. Falling under this line of thinking, Klein has said, “Can I be honest with you? I’ve always kind of hated films about climate change.” This film might just be a breath of fresh air for environmentalists. The event is waste-free, so attendees are encouraged to bring items such as reusable silverware, napkins or Tupperware. There will be refreshments provided by the Sustainability Division. The film is 90 minutes, and there will be a Q&A afterwards. The event is open to the public. For more information about sustainability at SU, visit the SU Sustainability website, follow @SustainableSU or @SOSatSU on Twitter and check out the Syracuse University Sustainability Facebook page.